I've always been a fan of costume jewelry, but I tend to love the most expensive options! I never seen such a good collection of Fashion Necklaces. Here is really a good creativity. We also have some designs of Fashion Necklaces. If you are interested then please visit. Holy crap. Great round-up! I'm partial to that Capwell bracelet (obv), but seriously: I will take them all, please! Woah, these are all super awesome necklaces! I would take them all! Nice blog dear and hope you have a good night! I'm obsessed with statement jewelry lately- especially pave links pieces like this gorgeous square link bracelet you've featured. Gorgeous! It really is—and I'm almost always lazy!! Nice! Nice products! They all look genius! Really wanna have them all! Thanks for your sharing and posting! 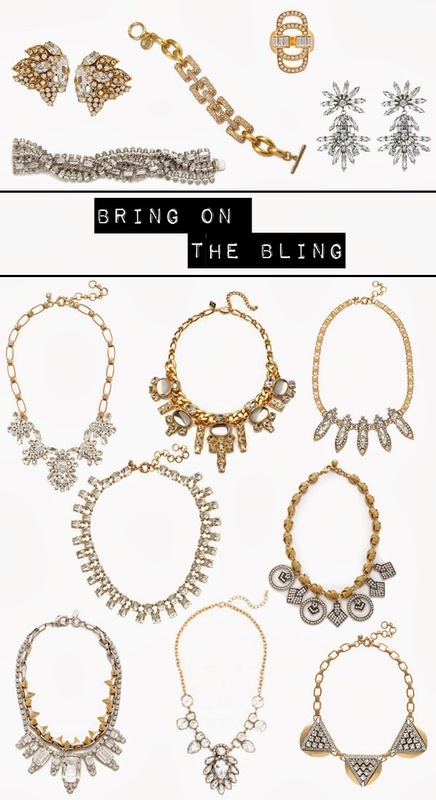 Love the tip about adding a statement necklace! It's so great and these pieces look stunning! I've always been skeptical about statement necklaces and prefer little dainty ones, but I should give it a go! You really should! It's easiest to start with a sparkly, simple collar—you'll get hooked after that :) they're great for sweaters in the winter! These items are all wonderful! Im a huge fan of jewelry, and the necklaces are perfect for a statement piece. Amazing jewelry! Love every piece. I need more pieces like this! You're right about a simple outfit with a wow accessory.